After clashes erupted in Kiev earlier this year, then-Ukrainian president Viktor Yanukovitch was ousted with parliament taking power on February 22. A month later, Russia's President Vladimir Putin signed a bill absorbing Crimea into the Russian Federation. Soon after that, large parts of eastern Ukraine, which are inhabited mostly by ethnic Russians, declared independence, following the example of Crimea. Meanwhile, the US and the Europe announced a series of ­sanctions against Russia. Some have described the subsequent downward spiral in relations between the two sides as a "New Cold War." 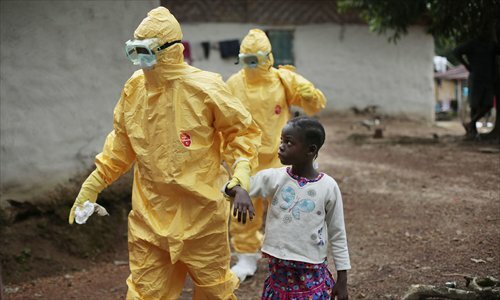 The worst outbreak of Ebola to date began in February in West Africa, and has killed 7,842 out of 20,081 cases recorded to date, according to the latest report by the World Health Organization (WHO). The WHO officially declared the outbreak a Public Health Emergency of International Concern in August. China has delivered four rounds of humanitarian aid worth of over $120 million to the African frontline and sent more than a thousand medical workers to the Ebola-hit countries. Malaysia Airlines flight MH370 lost contact with ground control on March 8 after taking off from Kuala Lumpur on the way to Beijing with 239 people aboard. The plane, which may end up in the southern Indian Ocean, is still missing. Four months later, Malaysia Airlines flight MH17 was shot down over Ukraine on July 17 with 283 passengers aboard during a flight from Amsterdam to Kuala Lumpur. The cause of the crash remains uncertain, with Russia and Ukraine accusing each other. Malaysian aviation was struck by tragedy again, with a Malaysia-based AirAsia plane was crashed on December 28 with 162 people aboard. A meeting of the Japanese cabinet on April 1 approved an easing of restrictions on weapons export, taking Japan another step away from its postwar pacifism. On July 1, the Japanese government officially decided to amend the constitution, allowing for collective self-defense and ending the purely defensive military policy Japan had maintained since the end of World War II. Japan's conservative turn on military security has raised significant concern among its Asian neighbors, and, when paired with confrontation over territorial issues, sent Sino-Japanese ties to a low during 2014. The Islamic State of Iraq and the Levant (IS) has captured large areas of Iraq since June and declared a caliphate across the west of Iraq, and the north and the east of Syria. The US launched its first airstrike against IS on August 8, followed by the establishment of a 60-plus-­member anti-IS coalition in September. Crude oil prices in excess of $100 a barrel on international markets began a steady slide in June, reaching nearly $50 at their lowest price. At midnight on November 27, the Organization of Petroleum Exporting Countries decided not to cut back supply, instead saying it would maintain crude oil production of 30 million barrels per day. China's anti-corruption campaign following the 18th CPC National Congress got more momentum this year. Over 41 officials of minister-level officials and above were investigated in 2014, with the four senior central government officials brought down. On June 14 it was announced that Su Rong, vice-chairman of the National Committee of the Chinese People's Political Consultative Conference (CPPCC) was being probed for suspected disciplinary violations. He was removed from his post on June 25. Xu Caihou, former vice-chairman of China's Central Military Commission, was expelled from the CPC due to serious corruption on June 30. Zhou Yongkang, a former member of the Standing Committee of the Political Bureau of the CPC ­Central ­Committee and the country's former security chief, was placed under investigation for suspected "serious disciplinary ­violation" on July 29. Ling Jihua, vice-chairman of the CPPCC National Committee and head of the United Front Work Department of the Central Committee of CPC, was also put under investigation for a "suspected serious disciplinary violation" on December 22. Radical activists, led by scholars including Benny Tai Yiu-tin, associate professor at the University of Hong Kong, initiated the Occupy Central protest movement on September 28, during which activists blockaded several roads in the region's Admiralty, Causeway Bay and Mong Kok districts. Hong Kong bailiffs backed by police started a final clearance of protest sites on December 11. Four days later, Hong Kong Chief Executive Leung Chun-ying declared the illegal occupy protests over. The protests caused great economic losses and upheaval in Hong Kong society. Beijing played host to the 2014 Asia-Pacific Economic Cooperation (APEC) meetings from November 5 to 11, during which Chinese President Xi Jinping laid out his vision for the Free Trade Area of the Asia-Pacific (FTAAP) process. The meeting later adopted the FTAAP roadmap. Playing on its "home court," China boosted its relationship with the US and improved ties with neighboring countries. Leaders from the US and Cuba announced the re-establishment of bilateral diplomatic relations on December 17, following nearly 50 years of US isolation of Cuba. The decision was warmly welcomed internationally, but triggered fierce debate within the US, with some Congressmen strongly opposing eased restrictions on Cuba.